Pardon me while I put on my big girl pants for this black diamond structured data whirlwind of awesome that is about to happen. I love structured data. Seriously. It might be my favorite SEM topic and I am beyond excited to be in a room full of Schema superstars. The session is moderated by Elisabeth Osmeloski (@elisabethos, Director of Audience Development, Third Door Media, Inc.) and there are three panelists who will be presenting. Ok – introductions aside, let’s get to it. It all started with a problem: People weren’t calling the same things the same things, and without consensus on what to call things languages aren’t all that useful. 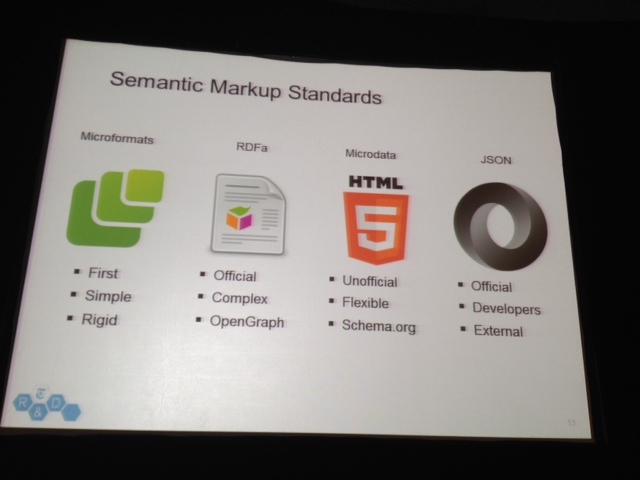 SO his company started looking at a way to formalize a language database – his markup language was called rNews. 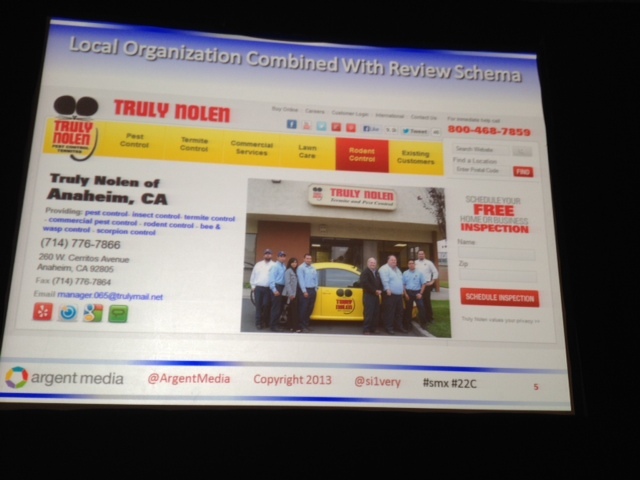 At the same Google was launching Schema.org; today Schema.org and rNews work together. The answer, as with all important things, starts with Justin Bieber. HTML is a standard for expressing the ways things should look; not necessarily what things mean. One underlying result of this is that your SERP results don’t look “as pretty” as those with markup that allow SEs to draw conclusions about meaning and implication. These are just tools that let you say “there is a thing in this thing called this.” IE: This is a headline. It doesn’t explain What a headline is; what the implication of a headline is – what “headline” means; why it matters. 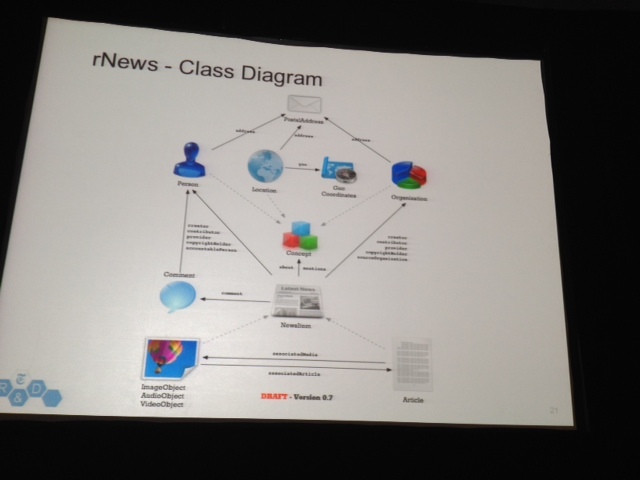 rNews is a data model. 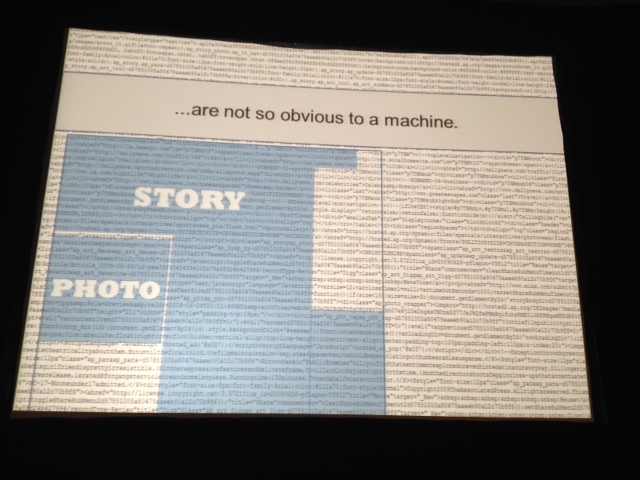 Developed for machine-readable publishing metadata into web documents (IE: headline, byline, tags, creator). It’s a set of suggested implementations. rNEWS expresses the syntactic features of a news document, but also expresses the underlying details of a news article. 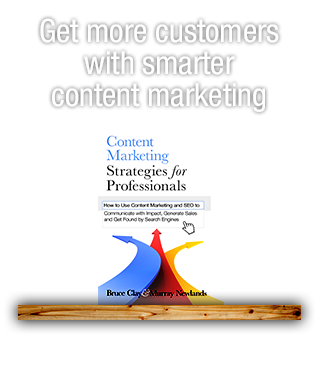 Like all semantic markup, it helps Search Engines and social networks better understand the meaning of content. 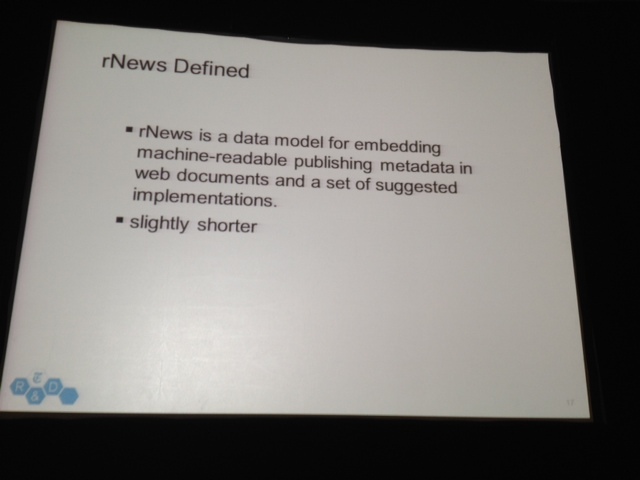 rNews scope: It was first proposed in 2010, then implemented on nytimes.com in September 2011. 1) Superior algorithmically – helps SEs and social networks understand your content to make assumptions about your content and then generated links that look pretty in SERPs and social feeds. 3) Better Analytics – here are all the page views you got on Semantic markup embedded in a page allows your search team to look at all pages on your site holistically. Schema was introduced about the same time as rNews – rather than trying to compete with Schema, rNews works with and collaborated with rNews. Warren Lee, SEO Manager, Adobe (@seocubed) is up next to talk about Schema at Adobe and strategic consideration in regards to which schema you should go after/work on. About Warren: Joined Adobe as an in-house SEO; helped take Adobe from all external to all-internal SEO team. 11 years in search and 15 years in Digital.. Adobe approaches Schema with a “How do we make, manage, optimize and monetize our product with Schema” mindset. Warren is going to offer three case study examples of how they (Adobe) use Schema (but he also reiterates that which Schema you go with will depend 100% on your business, your goals, and what you want to accomplish). How are they going to improve the relevancy of their current ranking algorithms – Warren thinks of G+ as an engine that helps Google evaluate your author authority. He thinks there is a very good chance it is going to become more of a ranking factor down the line. 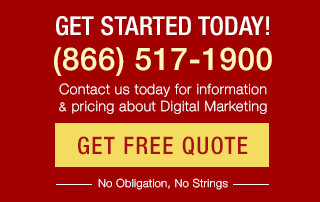 Three Reasons to Use Structured Data? If you need to make a case to your CEO, this is your section! 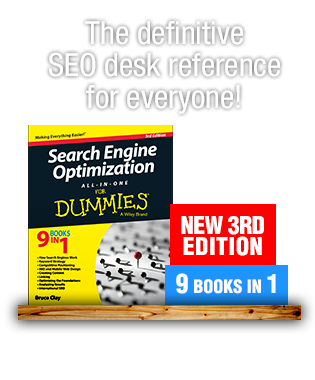 1) Enables search engines to more accurately interpret site content. Makes the message/meaning you are trying to convey crystal clear. 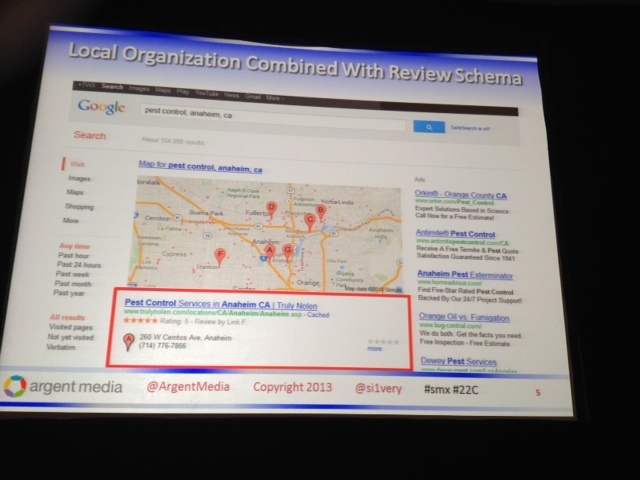 2) Can enhance your SERP listings, make them more attractive, and make them take up more real estate. 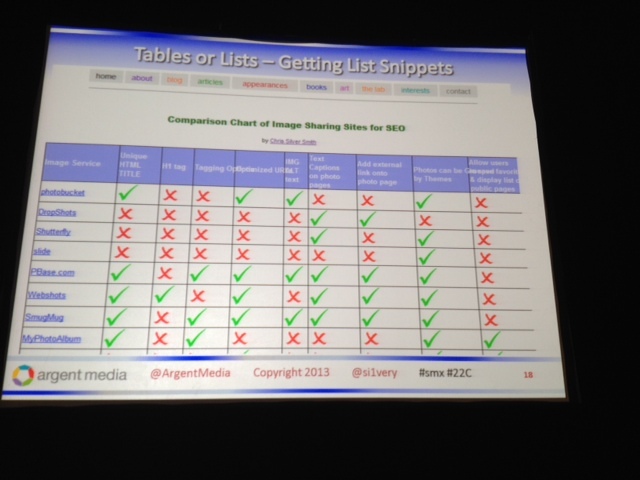 CTR may improve 15-50% with Rich Snippets. 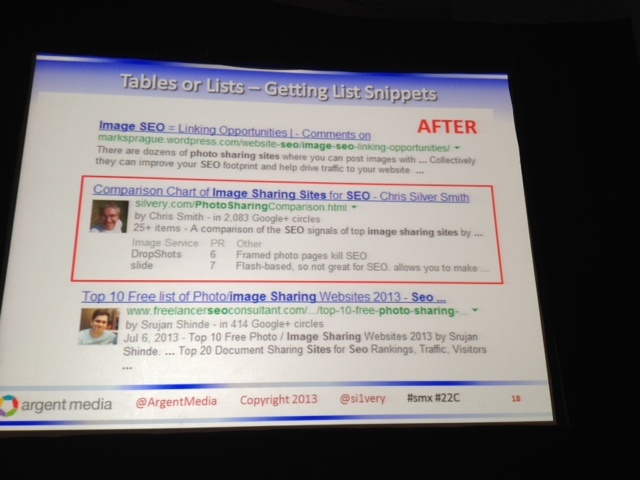 3) Can increase the number of links per SERP. Logically having more links per SERP = increased odds of clicks. Google actually calls this Schema implementation a “Bonus” for you; if they call is a “bonus” you should probably capitalize on it. 4) If Google doesn’t find any Semantic Markup it will just crawl your page and try to deduce its own description… which is not ideal. Use both OpenGraph and Schema.org markup simultaneously! 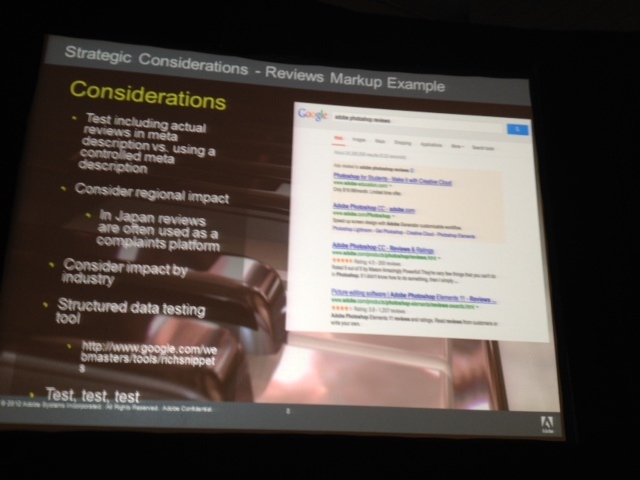 Always use the structured data testing tool! Check your assumptions. It will show you if you have your author markup implemented correctly, and it will check for any other schema markup you may have, too. 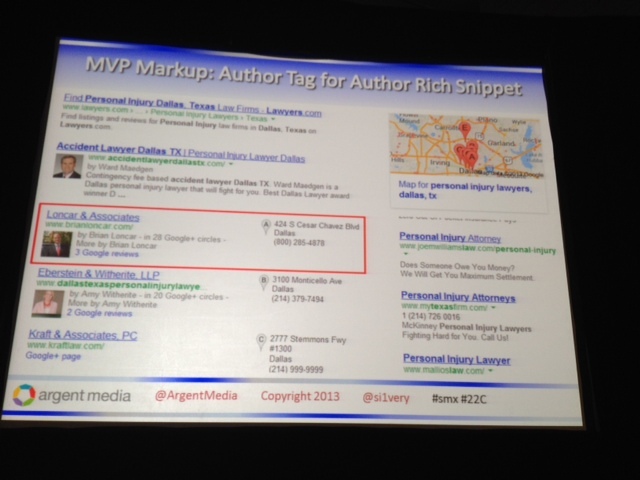 Biggest Tip of the Year for SEO: The Author Tag! Tables or lists can get Schema, too.